A whole chicken can be frozen if purchased raw or fully cooked. Frozen raw chickens should be used within 12 months, according to the United States Department of Agriculture. 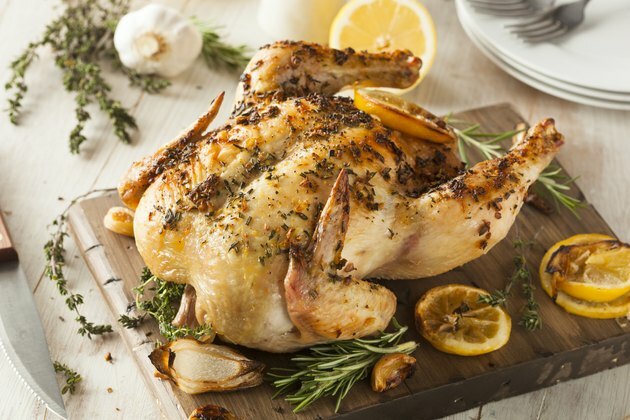 A fully-cooked whole chickens must be consumed within four months. When you plan to cook the chicken, thaw it in the refrigerator for one to two days, depending on the size of the bird. For faster thawing, place the chicken in a tub of cold water several hours before cooking. Wrap the whole chicken in several layers of heavy-duty foil or freezer paper. Do not remove the original wrapping, if there is one, if you plan to cook a frozen chicken within two months. Squeeze out excess air from the packaging to prevent freezer burn. Write the date you are freezing the chicken on a label, and place the label on the chicken. Leave the chicken on its own shelf until it freezes, so air can circulate around it. According to the Real Simple website, once food is frozen, it can be stacked along with other frozen items. Freeze at a temperature of 0 degrees Fahrenheit. To avoid the potential of food-borne illnesses, avoid adjusting the temperature in your freezer. After thawing the whole chicken at a temperature below 40 degrees Fahrenheit, you can safely refreeze uncooked portions. Check for freezer burned sections on the chicken after thawing. Brown and gray spots need to be cut off before cooking. Don’t use storage wrap alone to freeze your chicken. A single layer of wrap is not durable enough to keep odors and moisture away from your chicken. If you experience power failure, avoid opening the door of your freezer. Foods in a full freezer are typically safe for two days while a half-full freezer’s food lasts for about one day, according to the United States Department of Agriculture.